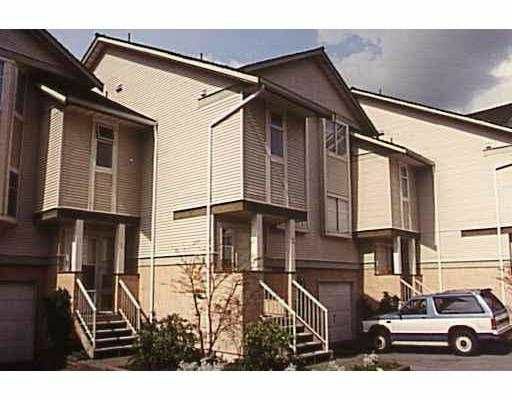 The "Place Pare" deluxe three level townhouse unit in small 20 unit complex. This unit is set well back from Brunette Ave, no road noise here. Large cathedral entry up stairs to large living room with gas heat and fireplace. Bay windows and sliders to sundeck overlooking tranquil backyard. Large formal dining room. Bright European kitchen with adjoining eating area with ship deck hardwood floors. Upstairs, large master bedroom with bay windows. Triple sliding mirror closet and full four piece ensuite. Children's bedroom plus full bathroom up. Downstairs is a rec room with sliders to patio and private backyar d, plus 2 piece bathroom, storage and single car garage. This property is easy to show. Vendors would like end of February or March 2005 dates or complete early and rent back until end of February or March . Extensive use of crown mouldings.